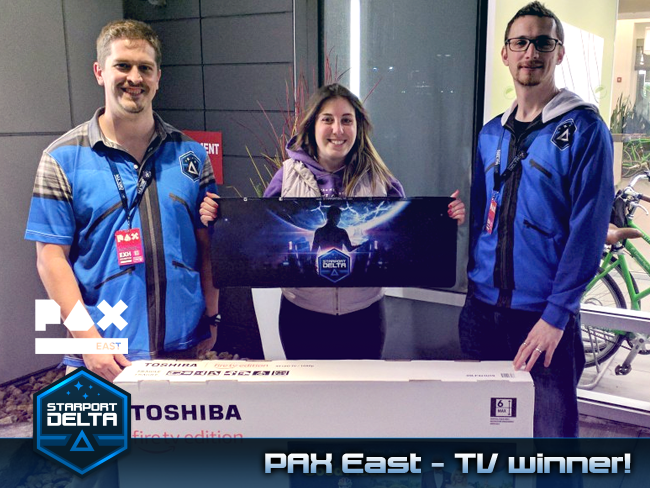 The Cloudfire Studios team had a fantastic time at PAX East 2019 this past week, a big thank you to Boston and all the gamers who came along. We then spent the rest of the week travelling back to New Zealand and recovering. We got a lot of great feedback and everyone seemed very positive about the game, which was really encouraging for us. It was also pretty awesome meeting players who had already wishlisted the game! 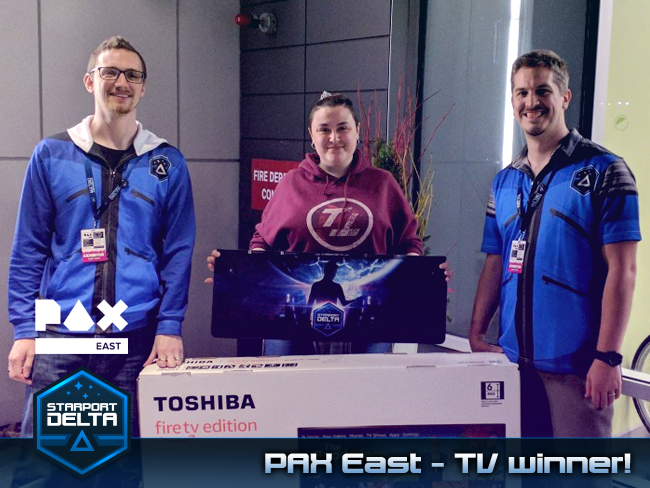 Our giant TV giveaway proved to be very popular, which was great for us as they weren't fitting in our bags for the trip home. Our lucky winners were super excited to get their TVs, and it was a great feeling to be able to share that with them. They also each received a wide-format Starport Delta themed mousepad. Starport Delta already has a few changes that we've pushed up to our alpha players based on the feedback from players at PAX, and we had a lot of people excited to join in on the alpha. We'll be sending out an email to everyone that was interested very soon, and another round of alpha player intake shortly after that. 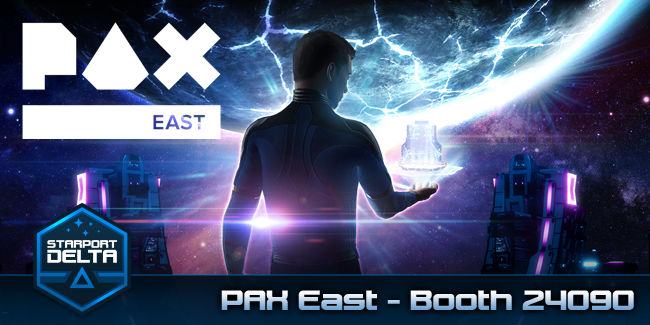 The Cloudfire Studios team have had a great start to PAX East 2019 over the last couple of days! We've already been tweaking Starport Delta based on the feedback we've been getting each day, and players have been excited to play and share their ideas, which is awesome. We are here for two more days at booth 24090. If you're going to PAX for Saturday or Sunday, make sure to stop by, say hi and try out the game! Starport Delta is a real-time strategy game where players must balance building and expanding a space station with managing resources, station maintenance and resident requirements. For strategy fans who want to build in space without worrying which personnel is in charge of lasers, Starport Delta helps you focus on designing and building space stations while dealing with the dangers and rewards of space. Explore new possibilities and maintain your vision with each station you build, while experiencing the universe and the stories of Starport Delta. You have been given the opportunity to command and expand a space station that will orbit the galaxy, periodically transitioning to different sectors with distinct challenges and resources. What will drive your personal designs? People or profit? Protection or mining? As the Empire's governance troubleshooter, you move from station to station, system to system, picking up where understaffed or negligent Commanders have problems with their stations that need fixing. Get resources supplied where they’re needed, cull unneeded expansions and ensure a sustainable supply of materials before you warp to the next station. Upgrades to your station happen organically through proximity. Grouping together 3 power plants in a cluster will supply a larger area with power and require less maintenance, as well as linking together their structural integrity. Design your own unique station designs by exploring the variety of different upgrades and the impact they each have. © 2019 Cloudfire Studios Ltd. All rights reserved.